Nails Inc’s Sprinkles Collection of polishes continues to raid the kitchen pantry for delicious inspiration – if Sweets Way was the hundreds and thousands on top of a cupcake, then Sugar House Lane is cookies n’ cream in a chocolate sundae! Sugar House Lane is a lip-smacking combination of black and silver glitter in a creamy milk coffee brown base – think an Oreo milkshake and you’re pretty much there (and now you’ve got me thinking about Oreo milkshakes… mmm)! The formula here is good, but not as perfect as Sweets Way. The glitter in Sugar House Lane is really densely packed, meaning there’s not quite as much base to produce that yummy glitter sandwich effect – meaning it dries a little more textured and gritty-looking than Sweets Way. However, in terms of consistency, dry time and ease of use, there’s no doubt that Sugar House Lane is still one of the most fuss-free but complex glitter polishes you’ll come across. 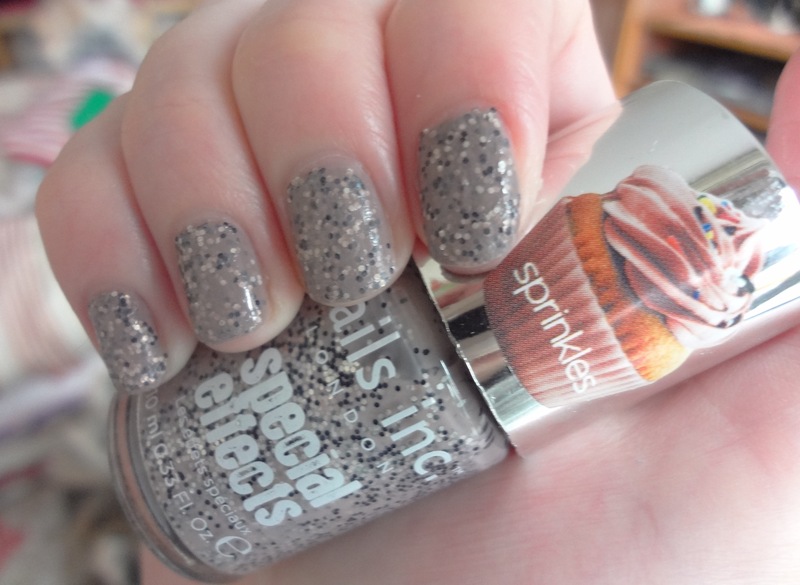 And the combination of the colours is truly great, almost an indie take on cutesy cupcake glitter. 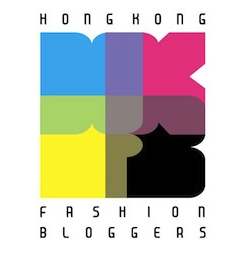 Who would have bet on blacks and beiges being in a collection inspired by fairy cakes?! I felt Sugar House Lane might have been even cooler if matte white glitter had been added instead of silver… but hey, I’ve just been thinking about Oreos too much! In addition to looking seriously gorgeous, these Nails Inc Sprinkles polishes make me very hungry. If you have more will power than me (guiltily wandering off to 7-11 to find a Hershey’s Cookies N’ Cream bar as we speak), Sugar House Lane is cuteness without the calories – drool-worthy in more ways than one! Lord help me, I still have another two Sprinkles polishes to review – who knows what other sweet treats I’ll find myself craving after those! 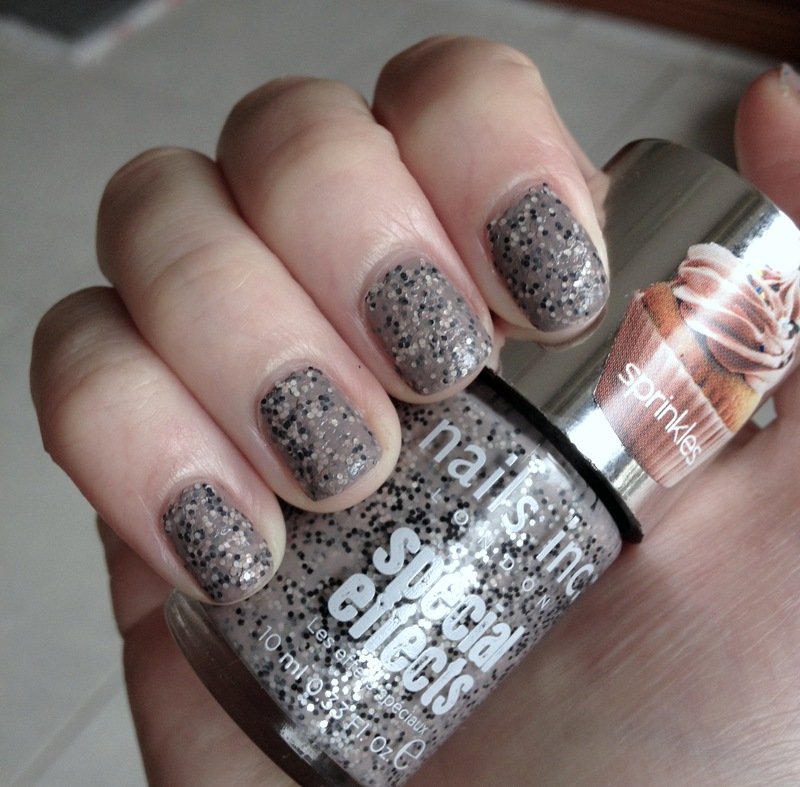 This entry was posted in Beauty and tagged Beauty, best glitter nail polishes, cosmetics, glitter, make-up, nail lacquer, nail polish, nail varnish, Nails Inc, photos, review, Sprinkles Collection, Sugar House Lane, swatch. Bookmark the permalink.